Season 3 of HBO’s Insecure has returned, so I decided to rewatch all the foolishness that was season 2. While the season had more side-eye worthy moments than I could possibly write about, I did enjoy the ongoing money lessons that were dropped. If you happened to have watched the show but missed them due to all the messiness the characters have, here are four anyone can use. In season 2 of Insecure, Molly discovered her firm has been paying a white male associate significantly more than her. (We are going to overlook the paper checks and other mess-ups that launch the storylines.) But it started a good conversation. Across the board, black women in American make 34% less than white men and 21% less than white women. Do your research. Make sure your salary and benefits align with the industry standard before accepting a job. If you’re like Molly and find out later on down the line, you can play long ball and position yourself to ask for the raise increase you deserve. Take that research you did and add yourself into the equation. Reflect on those small or big work wins and compile them. If that doesn’t sound appealing, you also have the option of entering the job market again. With offers from other companies, you can ask your current company to counter or take a new position which is what Molly did by the end of the season. You don’t have to be stuck earning less due to racism and sexism. From Kelli focusing on her physical health to Molly finally making her mental health a priority, there was an emphasis investing in yourself. With Kelli, it was mentions of running a 10K and using a Fitbit to preparing for the race. Molly started scheduling regular sessions with her therapist. Both of their health journeys highlighted that there are big and small steps to take when it comes to investing in your health. Things like tackling your mental health can be costly, but some therapists offer income-based session rates. If you aren’t rolling in dough because you’re underpaid, there are still affordable ways to invest in your health. Buy a kettlebell, yoga mat, and some runners, and watch Youtube videos to help you establish a routine. Shawn of It’s Shawn Fitness & Wellness has some excellent resources. If you do have more disposal income, perhaps you can look into a pass for fitness classes if you require more of a structured setting, or get a personal trainer who will whip you into shape. Living your best life means making financial decisions that will benefit you long term — and choosing to invest in your health is one way to do that. I know this seems logical and a very common sense statement but both of those things seem to be missing in society. Throughout season 2, we saw Issa struggle to stay in her apartment post-breakup as the neighborhood became gentrified and the cost of living rose. During all of this, she still wanted to go out with her friends and travel. As the season progressed, we saw Issa come to the realization she couldn’t do everything she wanted to. That meant no trip to Morocco with her best friend, giving up the option to live alone, turning down nights out at the club, selling items to have extra money, and living with a family member to save up. Hopefully, you don’t have to make such drastic decisions, but it is a good reminder to at a look at your financial situation. Could you possibly move to a cheaper place or get a roommate to help you save. When Issa got into a car accident, she didn’t have the savings to get it fixed and had to rely on public transportation, friends, and ridesharing to get around LA. Had she been living within her means or tried to find a cheaper place with a roommate, she potentially could have had an emergency fund. Ask yourself: Are you paying for a cable package but only watch shows once or twice a month? Do you really need to live in the area you do? Is that weekend trip to Miami worth it? Is it necessary to get a bottle of wine each time I go to the grocery store? It may not seem like much, but those dollars add up and could be funding other aspects of your life. Adulting means making the hard decisions. One thing I loved about season 2 was the ongoing discussion about finances. Even when it was clear characters were uncomfortable or upset, they still happened. From Kelli telling Issa she was being delusional for thinking she could afford to live alone, to the crew still extending invitations to Issa even after she mentioned her financial woes. When you’re in a financial rut or even on a financial uptick, good friends will be there to support you. They will hold you accountable when you need to hear those hard truths, they won’t take offense to you not being able to attend certain events, they will remember you have agency to decide what you can or can’t do, and they will help you strategise your next career move if that’s what you need to do.The important part is to use your words. I know not talking about money is the American thing to do, but we need to cut that out. The whole world doesn’t need to know your business, but those that matter should. You’re an adult. If people don’t know your situation they can’t be there to help you. Molly received tips on dealing with being underpaid. When it was time to move, the crew was there to help Issa pack. Molly and Issa had a Morocco night at Molly’s place so they could still have a mini staycation and a break from reality. 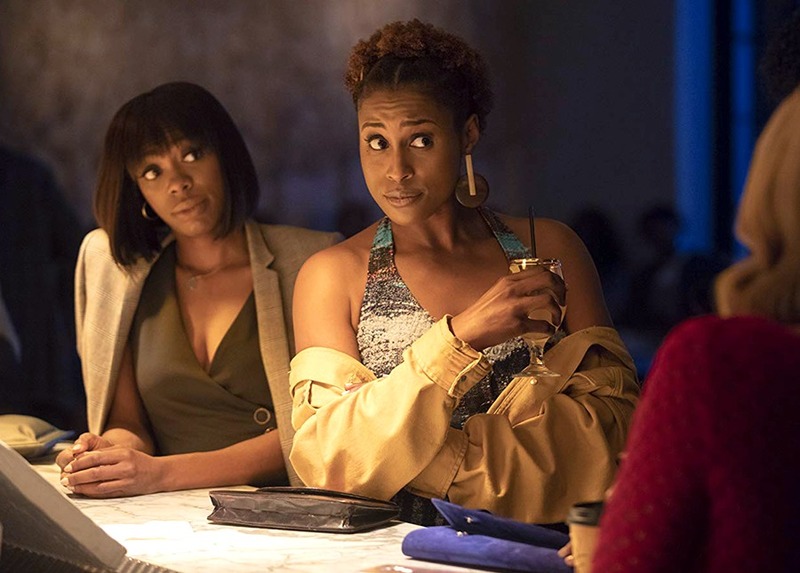 If you’re a fan of Insecure, are there any money lessons you gained from season 2? Are you looking forward to watching season 3? What shows have taught you valuable money lessons over the years? Aitza B is a millennial Native Floridian turned Tar Heel who spends her time taking photos, drinking cups of tea, ranting about plotlines, learning to code and stanning for Beyoncé and Serena Williams. She loves writing about pop culture, personal finance, books, black womanhood, and career advice with the hopes of encouraging others. Visit her blog, Petitely Packaged, and say hello to her on Instagram or Twitter.